Who doesn’t love mint chocolate? These Mini Mint Chocolate Cheesecakes are perfectly bite sized and packed with chocolatey mint flavor! They start with a sweet pecan crust and the cheesecake layer is super creamy and decadent. You would never guess they were vegan! These mini cheesecakes are also gluten free and paleo. They are a super cinch to make too. ZERO cooking required! This recipe would be great for your holiday parties. You can make it a day ahead so you can spend time entertaining your guests instead of slaving away in the kitchen. 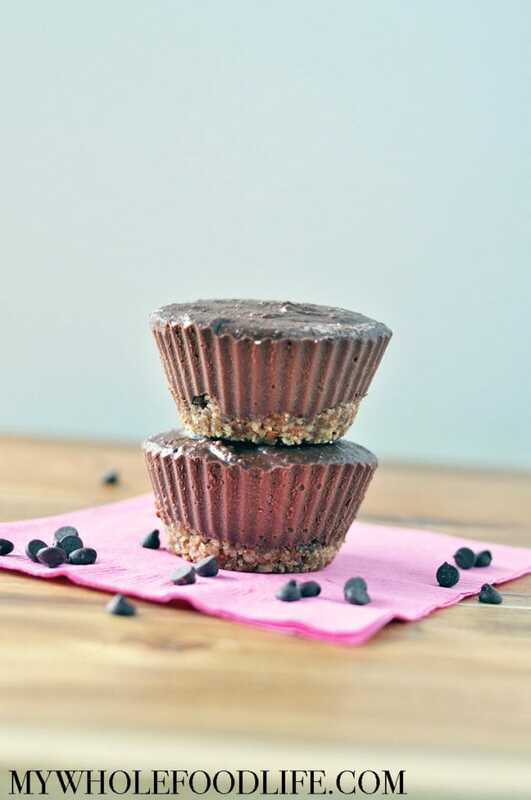 The perfect blend of chocolate and mint make these bite sized treats fun and delicious! Vegan, gluten free and paleo! To make the crust, add the 3 ingredients to a food processor and blend. You may need to add a splash of water to make the mix come together. Press the mixture into a lined or greased standard muffin pan . It may be slightly crumbly. That's okay, it will firm in the fridge. Once all the crust mixture is pressed in, place the muffin pan in the fridge. To make the cheesecake, blend all the ingredients in a food processor until smooth. Spoon mixture on top of the crust in the lined muffin pans . Place in the fridge to set. It should take about 4 hours to set, but you can also place in the freezer if you need it to set in a shorter amount of time. Should the coconut oil be melted or in solid form? Should the raw cashews be soaked overnight? Yes! Let me edit that recipe.